Product #6253 | SKU CLKV331 | 0.0 (no ratings yet) Thanks for your rating! The Chameleon 3 Port HDMI Switch allows you to connect up to 3 HDMI sources to a single display. Simply switch input sources via the included remote control or via the button mounted on the switch. 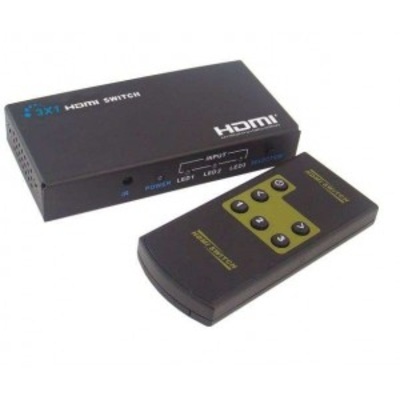 Perfect for connecting amplifiers, Sony PS3, Blu Ray players or set -top boxes to displays with only a single HDMI input. No power supply is required for HDMI cables under 10 metres. An optional 5V 1A power supply can be used for HDMI cables up to 15 metres in length. High quality components mean these units are designed to last a lifetime. The Chameleon 3 Port HDMI Switch supports up to and including full 1080p/1920Ã—1200 High Definition content with HDMI 1.3b compliance. Switch between 3 HDMI sources easily. Powered from HDMI cable - ensures high-quality signal transmission. HD Audio format: LPCM, Dolby-AC3, DTS7.1, Dolby True HD/DTS-HD master Audio. 24K gold plated HDMI connections. Compliant with HDMI 1.3b and HDCP.